Recently we had a Georgia driver ask our forum what to expect if he was involved in an accident which was not his fault and was subsequently stopped for DUI. The driver submitted to a breathalyzer test but then refused the chemical test. Unfortunately, the driver did not mention whether he tested over the legal blood alcohol limit of 0.08% or if he was ultimately arrested for drunk driving, but there are several issues we can discuss. If you are operating a motorized vehicle in the state of Georgia you have given your implied consent to submit to a chemical test of your blood, breath or urine. A blood alcohol test refusal will result in an automatic license suspension from the Georgia Department of Motor Vehicles, regardless of whether you are convicted of drunk driving through the criminal DUI process. What is not clear from the drivers question is if they refused the chemical test or if they refused the preliminary breathalyzer test at the scene of the traffic stop. In Georgia the preliminary breathalyzer test this is generally done with an Alco-Sensor test on a hand-held device. This test is not considered mandatory but is used simply to establish probable cause for the DUI arrest. If you are arrested for DUI after completing the preliminary breathalyzer test or the field sobriety test you may be taken to the police station for an official chemical test. At this point the law enforcement officer should notify you that you have been arrested for drunk driving and inform you of the repercussions of refusing the chemical test under Georgias Implied Consent laws. What happens if you refuse to take the blood, breath or urine test? 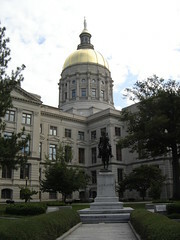 You will have your Georgia drivers license suspended for 12 months (a restricted license will not be available). Challenges to the administrative hearing can be made within 10 days after your DUI arrest and are generally very difficult to win. Keep in mind, this suspension, as mentioned above, is separate from any penalties you might face if you are ultimately convicted of drunk driving. The driver on the forum mentioned that he was involved in an accident, although it was ruled that is was not his fault. Depending on the evidence surrounding the Georgia DUI arrest this may not affect whether or not he is arrested for DUI. Keep in mind, if a driver submits to the breathalyzer and the officer has sufficient evidence to arrest them for DUI the state may not need the BAC chemical test results to prove that the driver was driving under the influence of alcohol. Other evidence can include the testimony of the officer and other witnesses, physical evidence, incriminating statements made by the driver and the field sobriety test results. All this together may be enough to prove DUI impairment.